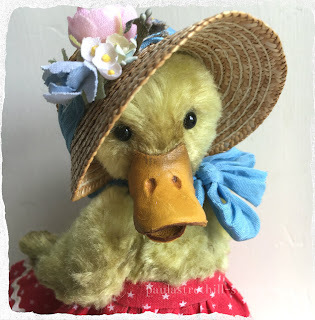 Miss Lucky Ducky is 7.5" high and created from vintage plush in duckling yellow. I have hand dyed this plush a lovely spring time yellow and aged tinted. She has a sculpted leather bill and jointed wired wings. 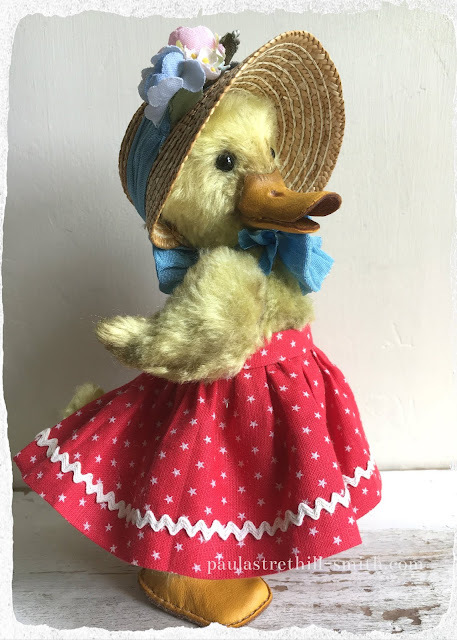 Miss Lucky Ducky wears a vintage red cotton skirt with tiny stars. Her fine straw Easter bonnet which is removable is trimmed with vintage flowers and ribbon. Her duck web foot shaped shoes are sculpted in our studio and made with leather. Fiorello stands 7" high and created from mohair in old gold.I have further aged and tinted his fur. Dressed in a silk jacket made from antique textile of Chinese silk with exquisite floral embroidery. 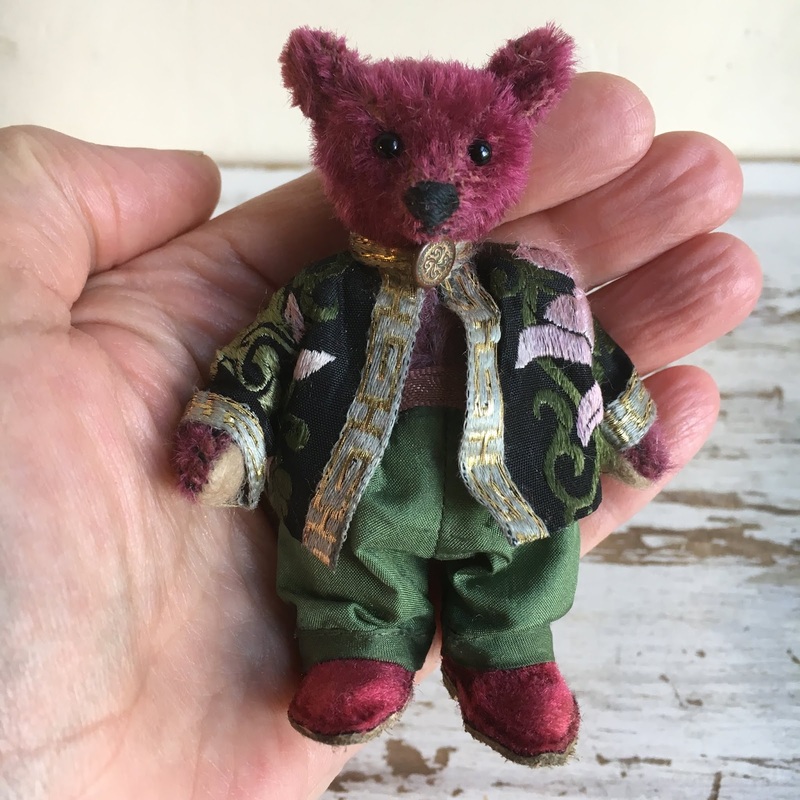 His trousers are from hand dyed silk satin to match his jacket. 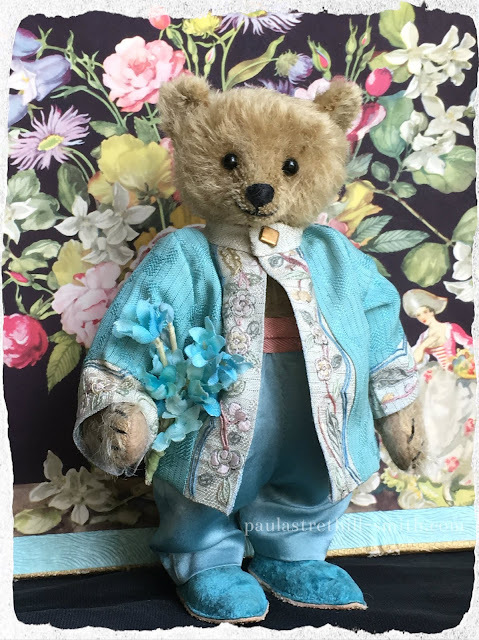 Fiorello wears our antique velvet shoes also hand dyed which are made by ourselves in our studio and hand stitched with leather soles.He carries a small bouquet of vintage flowers. 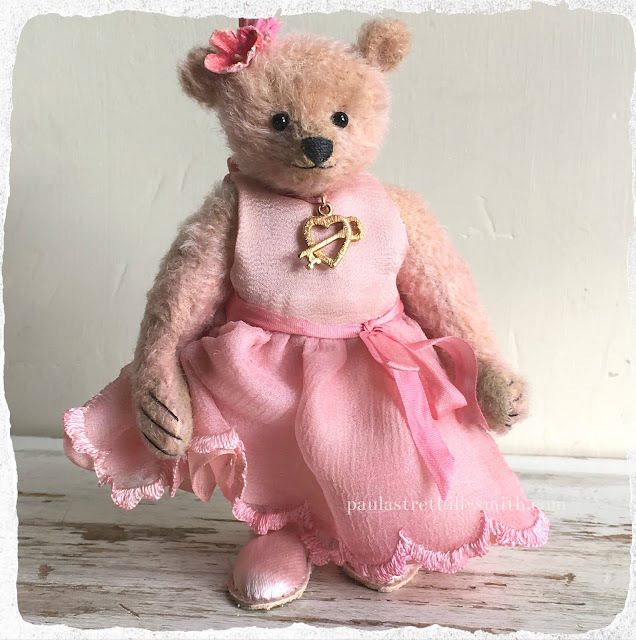 Miss Sakura named after Japanese cherry blossom trees stands 4" high and is a new pattern. 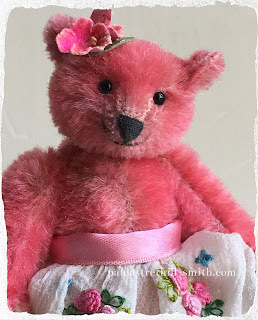 She is created from hand dyed blossom pink mohair. She is dressed in antique silk crepe skirt with net petticoat and hand embroidered flowers. Miss Sakura has our hand made vintage leather shoes in off white. 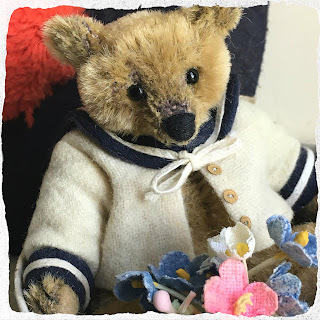 Tiny vintage flower blossom headpiece. 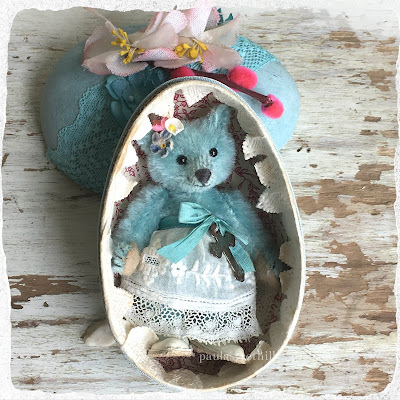 Miss Lark stands 3.5" tall and is created from hand dyed mohair in a robins egg blue. She is dressed in hand dyed antique silk crepe with a net petticoat. 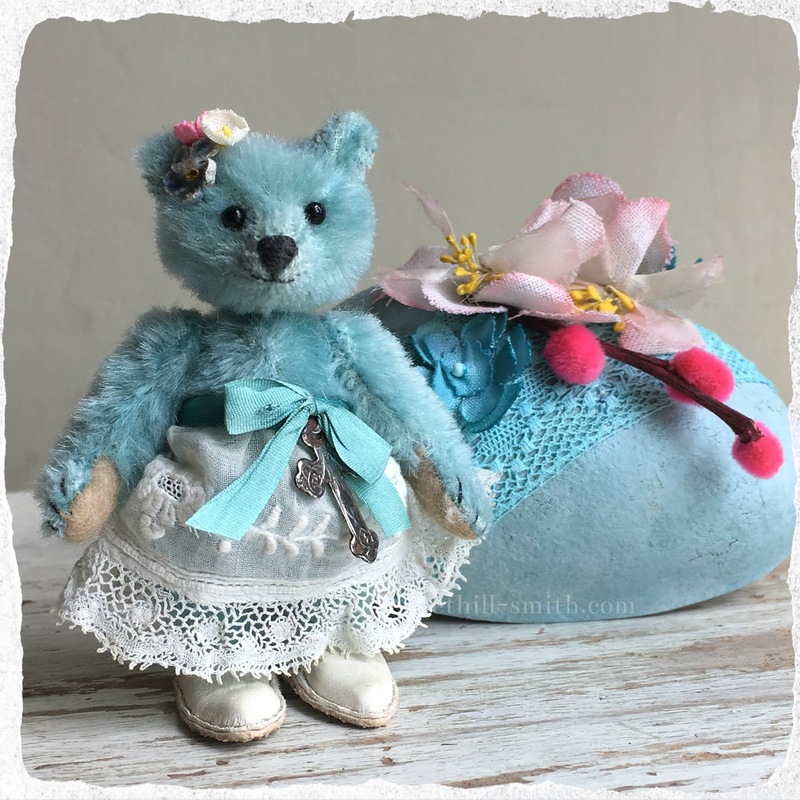 She has our hand made slippers in soft blue velvet. Tiny Vintage flower blossoms as a head piece. 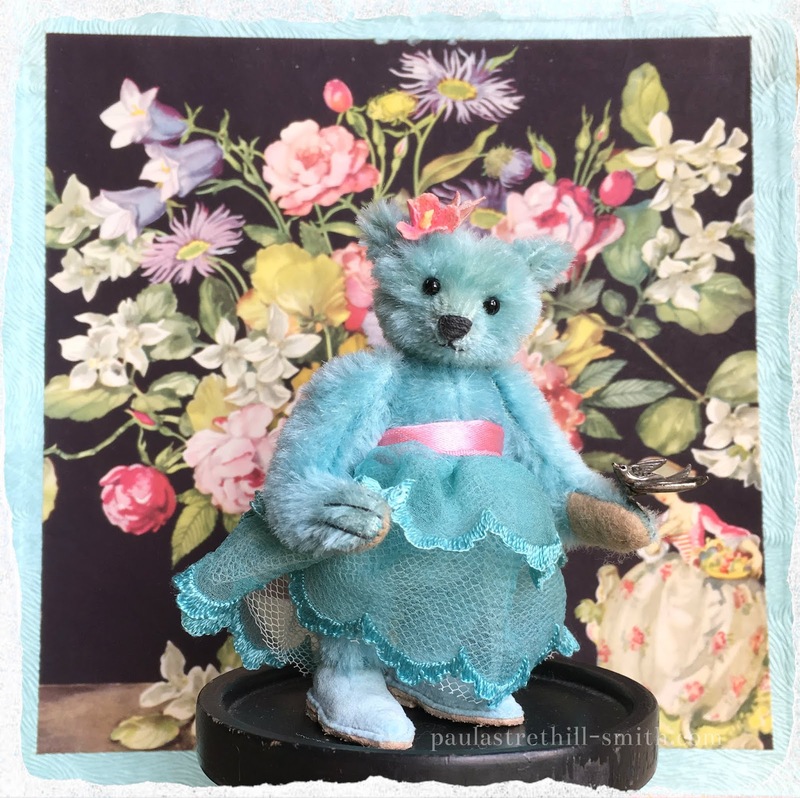 Miss Lark holds a tiny vintage marcasite bird on her paw. 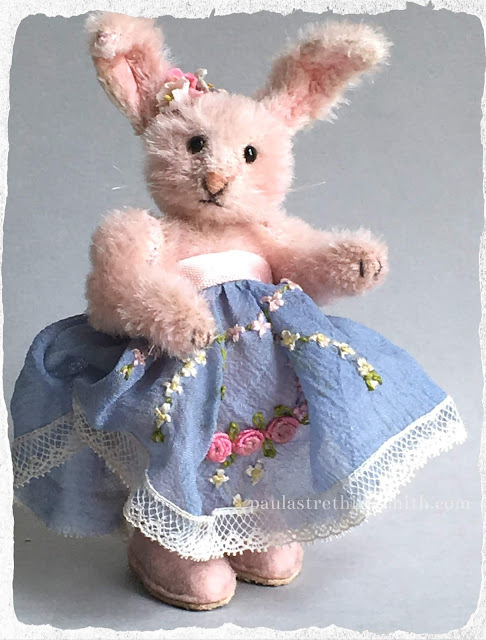 Belle stands 3.5" created from hand dyed pale pink mohair. Tinted silk plush lined ears which are wired. 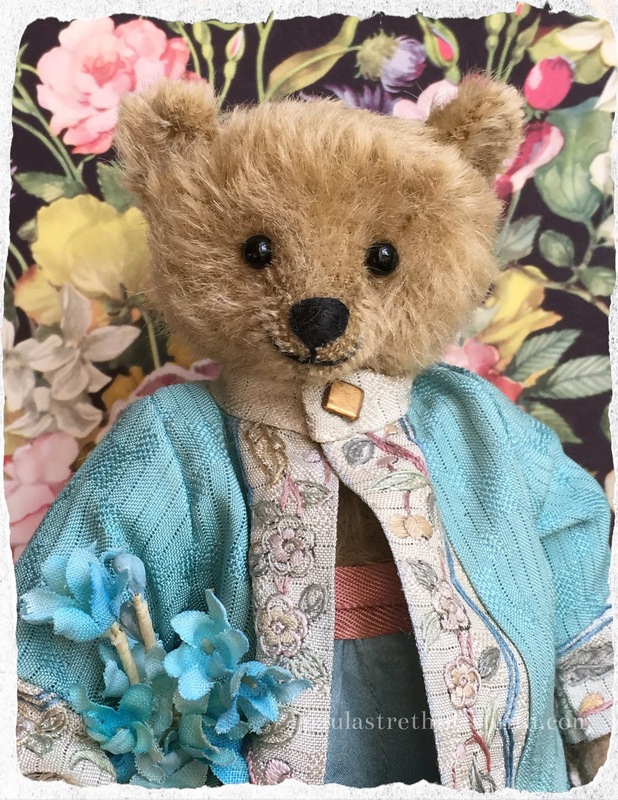 Belle is dressed in antique silk crepe skirt in a bluebell blue with tiny hand embroidered flowers. Her wool felt slippers are handmade with leather soles. Happy Bunny stands 3.5"created from hand dyed and tinted mohair. He has antique glass eyes which adds to his funny bunny appearance! Silk lined wired ears which can be posed. He wears pale blue trousers,jersey top and braces. 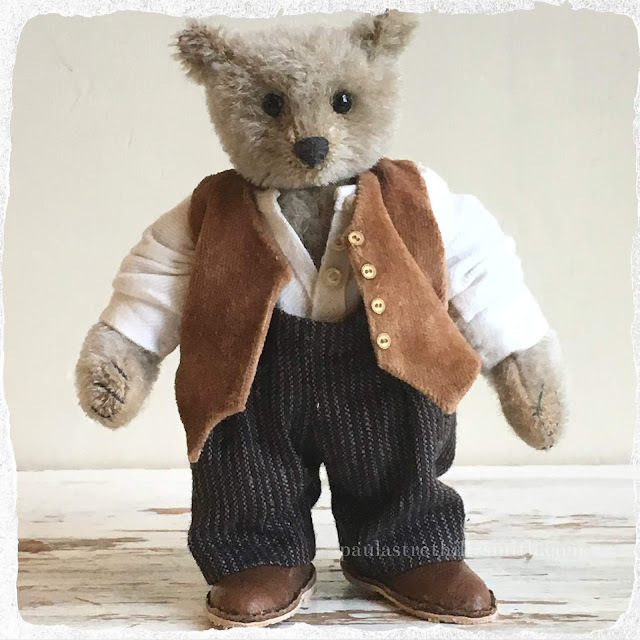 He has our handmade shoes from vintage leather shoes in dark brown. 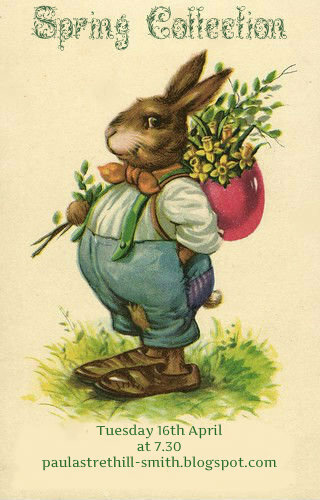 Happy Bunny is carrying a easter egg filled with tiny vintage flowers. Magdalena stands at 3"high created from hand dyed mohair in robins egg blue and is a new pattern. She wears antique lace cotton embroidered skirt with silk ribbon and antique religious cross. Magdalena has our hand made slippers in vintage off white leather. Tiny vintage flower blossoms as a hair piece. She comes inside a vintage German easter egg which I have painted and decorated with vintage flowers. 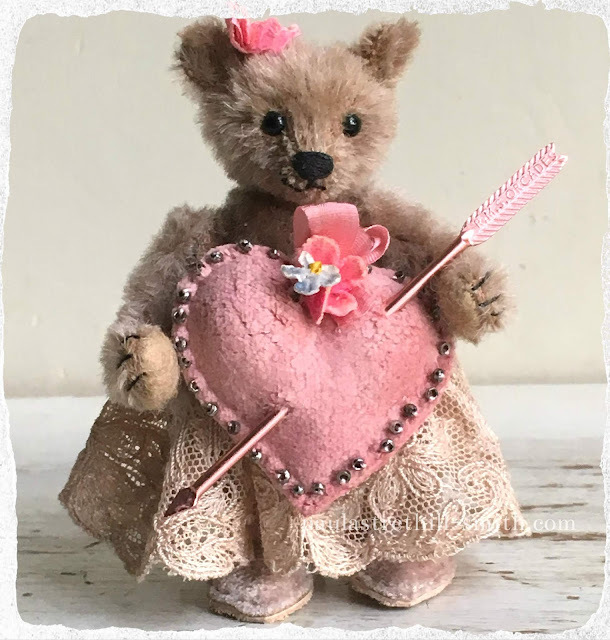 Thanks you for visiting our blog show should you wish to adopt any of the designs. Hello just a little note that our Spring Collection is coming to our blog soon. One more weekend and I should be ready to share a few new designs with you all! 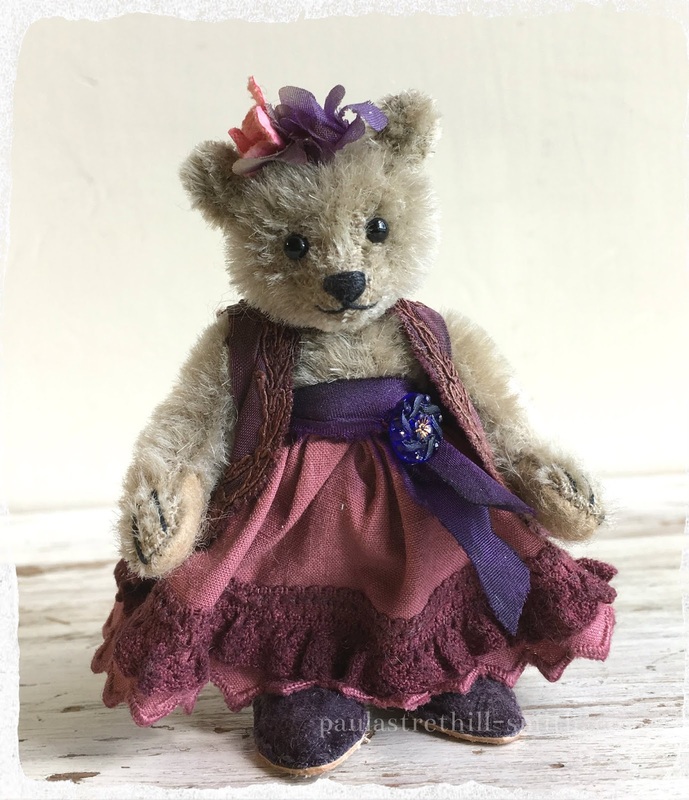 we are just back from Hugglets Winter Bear Fest and we just thought we would share a few of the designs we exhibited. Further down there are a few pieces that are looking for new homes should you wish to adopt any of them please let me know by email. 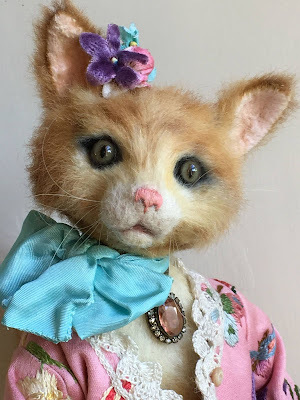 Mademoiselle Kitty one of our large sculpted art cat doll pieces. She has full face sculpt and shoe sculpts by Simon. Created from vintage mohair with silk plush tail. Airbrushed with premium glass cats eyes. 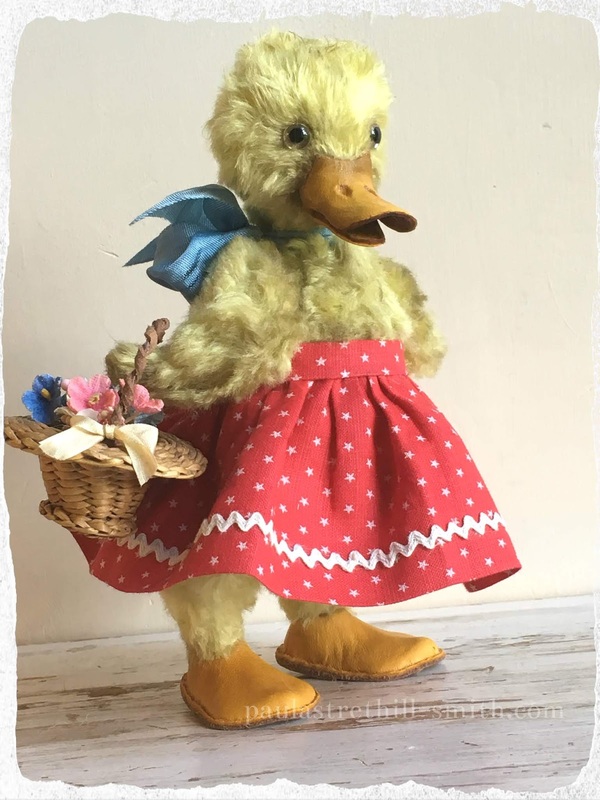 She has poseable wired limbs and paws and fluffy tail. which is lined in silk and trimmed with antique lace and mop buttons. She wears a vintage jewel around her neck and some antique flowers. 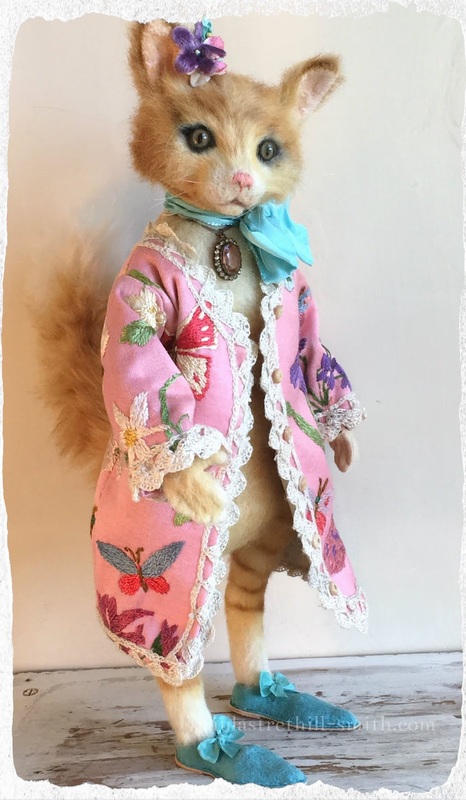 Mademosel Kitty is wearing antique velvet shoes made by our selves. Commission's taken for other Kitty cats. 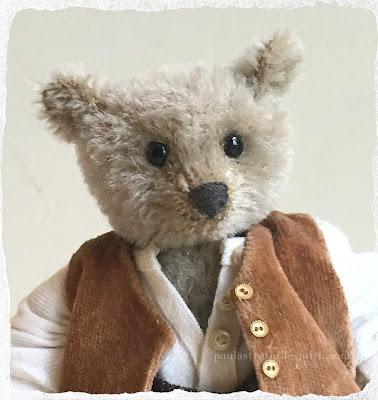 Archiebald is 6.5"high and created from antique mohair which is quite bald in places. 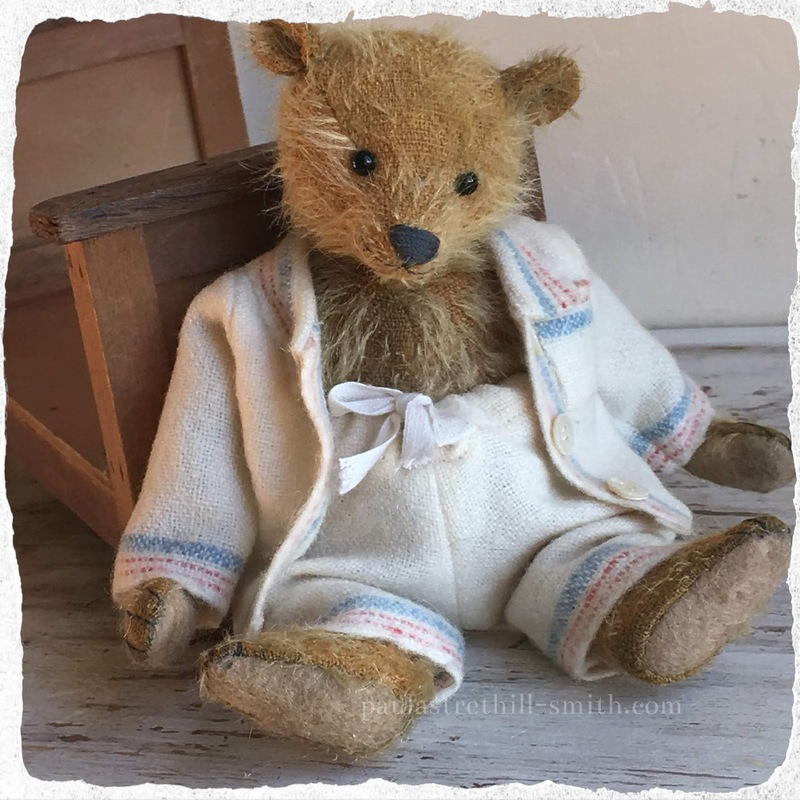 Archie wears a vintage wool cosy pyjama outfit with mother of pearl buttons. 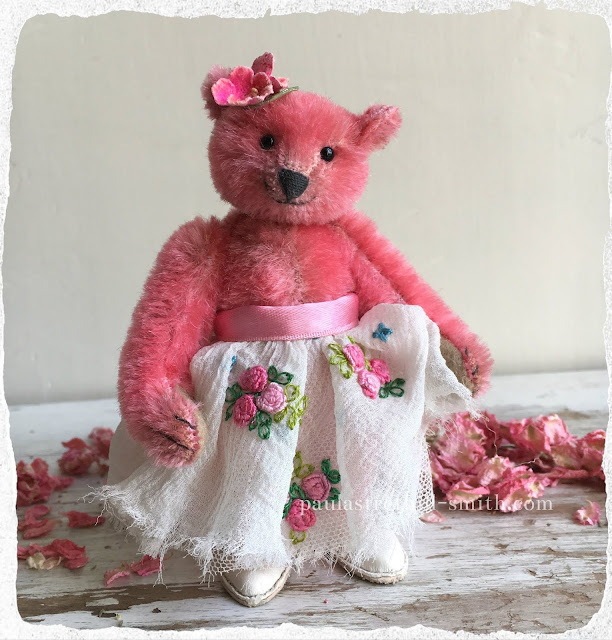 Satine is 4.5"high and created from palest pink mohair. She wears a pale pink antique silk jacket edged in satin. Cream lace on side and back of jacket. Satine has a full antique lace skirt trimmed with satin waistband. 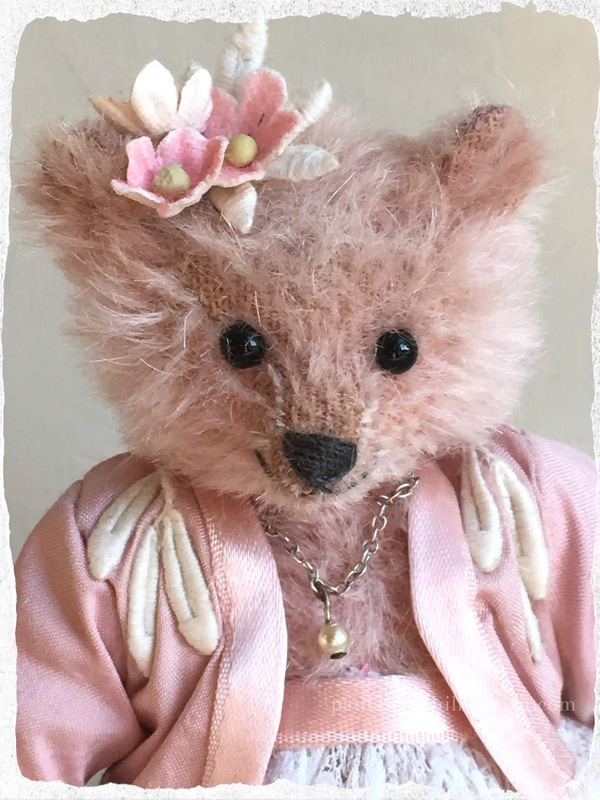 She wears vintage flowers and tiny silver necklace and pearl. 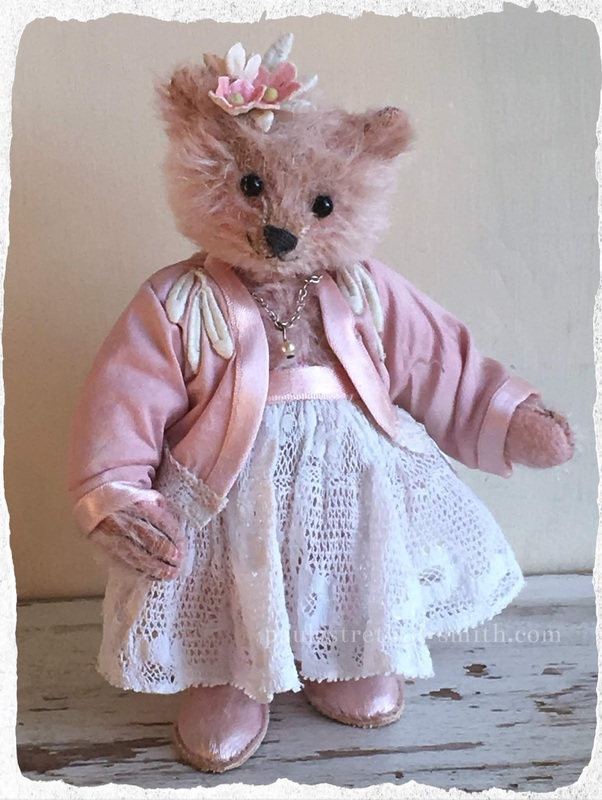 Her shoes are created by ourselves with pale pink satin. 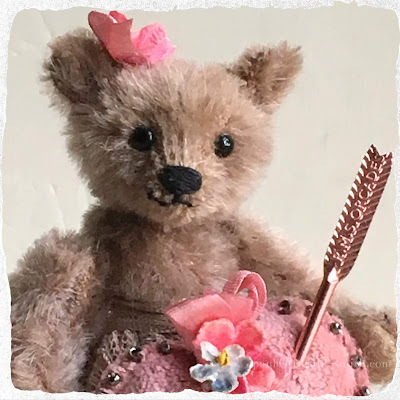 Cadence is 3"high and created from soft taupe mohair. She wears a cotton boho skirt with a embroidered bolero in dark amethyst. Her shoes are dark purple velvet slippers. 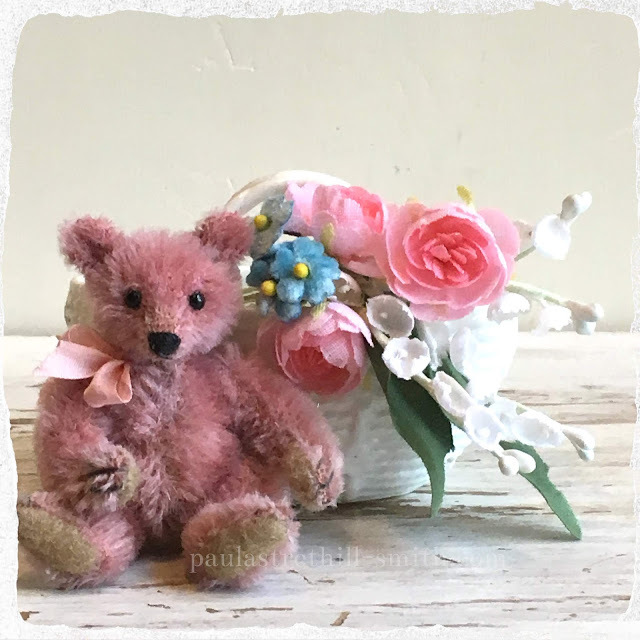 Trimmed with antique flowers silk ribbon. Cayeux is 3" high and created from antique mohair in old gold. 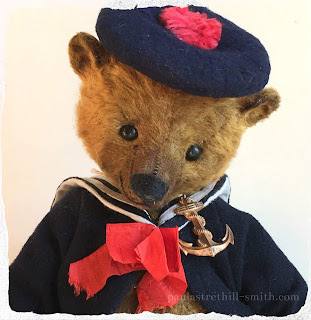 He wears a vintage wool sailor jacket trimmed with brass buttons. Cayeux is sat in a antique chocolate box made to like a sailors hat. The antique box is from Cayeux sur mer. 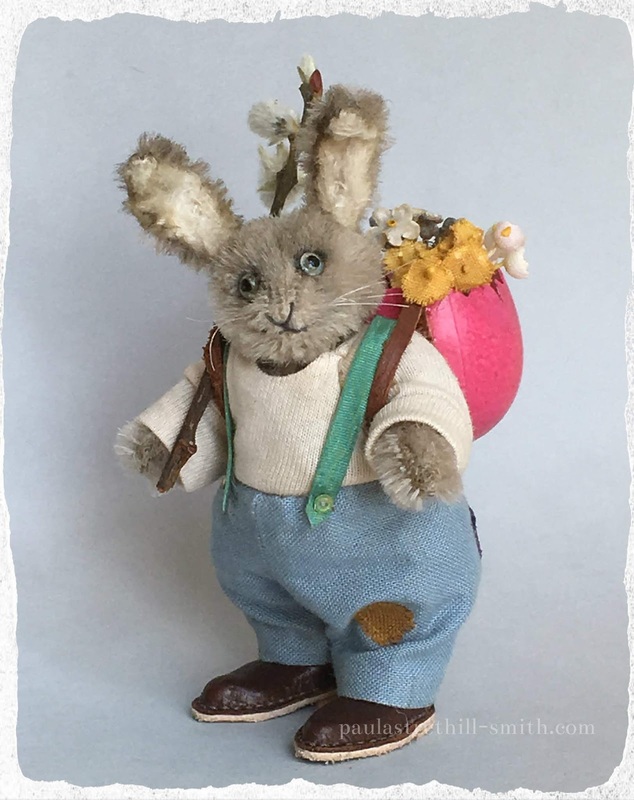 and a large sculpted animal art doll design. We looking forward to meeting some of our collectors and friends at the show. We appreciate that not all of you can visit the show as many of you live very far away. So we will of course share some of our designs here on our blog afterwards. 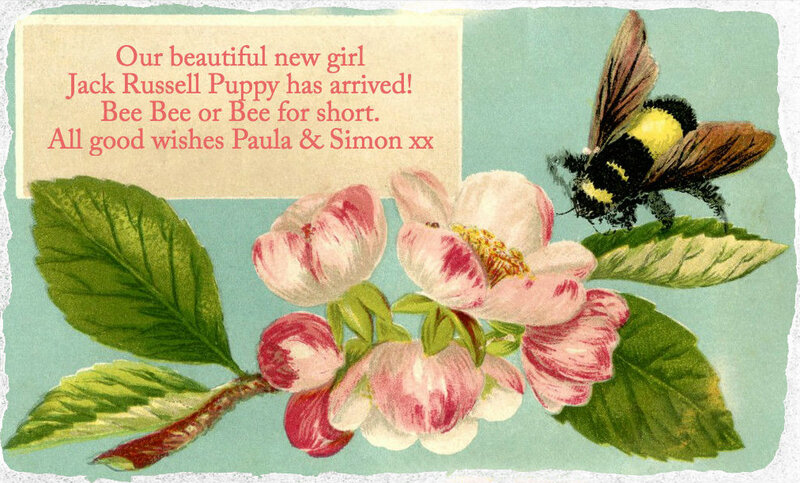 Warmest Wishes Paula & Simon. Welcome to our latest designs from our studio. Lady Constance Chatterley is 4.5" high and created from hand dyed pale pink mohair. 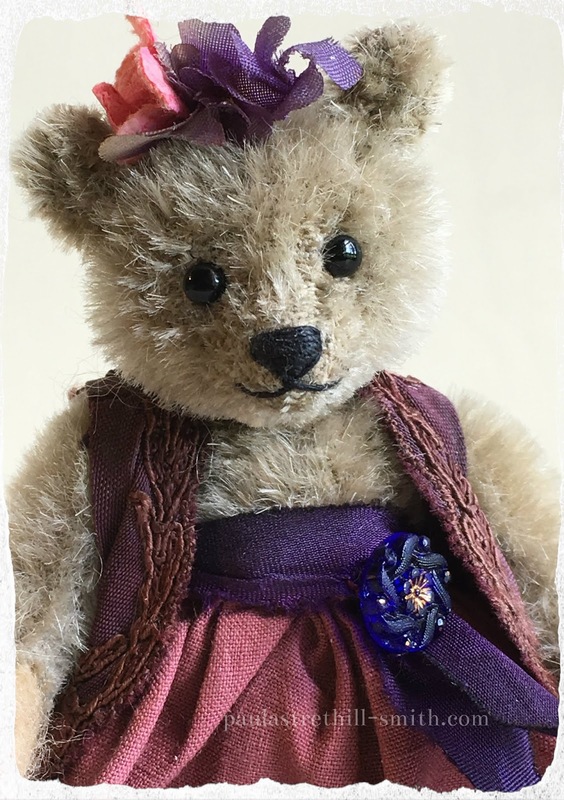 I have further tinted and aged her fur.She wears antique silk dress in a fine silk crepe with underskirt. 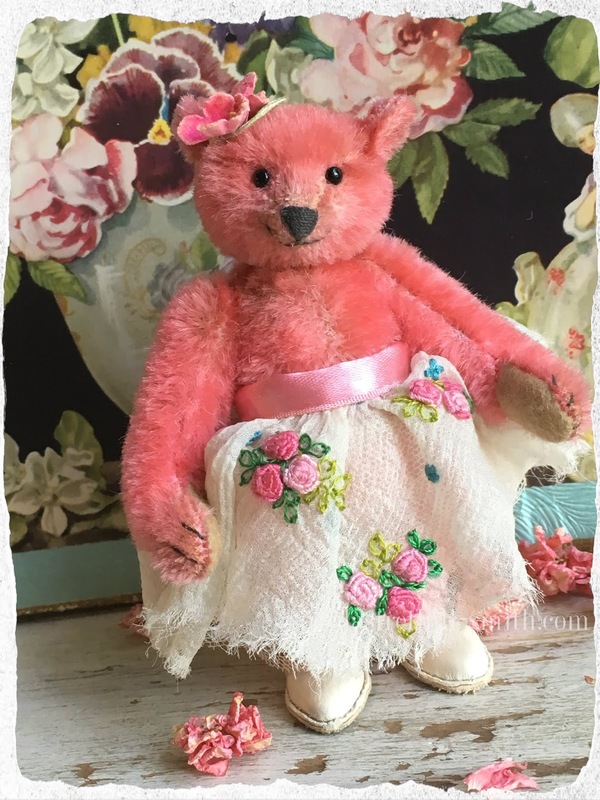 Her slippers are made from antique satin in palest pink and hand stitched with leather soles. 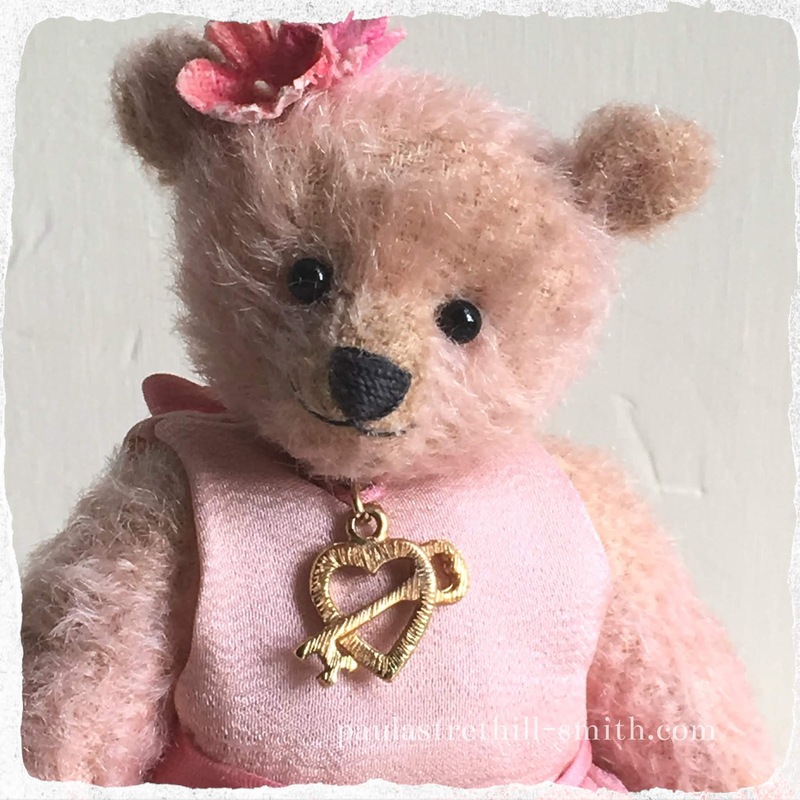 Lady Constance a vintage flower head piece and a gold tone heart and key. 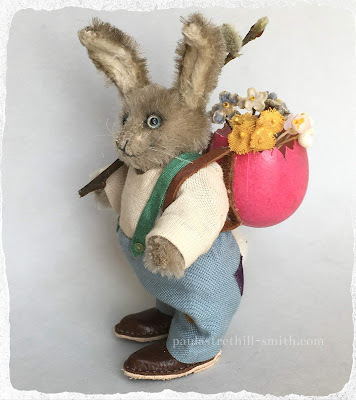 Which was a precious gift from the gardener! Mellors is made from mohair in a beige taupe shade which I have further tinted in places. 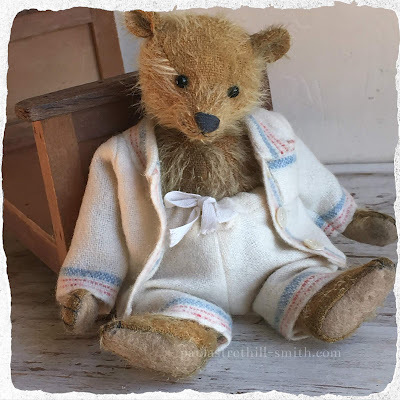 He wears striped gardening trousers antique cotton shirt and velvet waistcoat. His vintage brown leather shoes are made by ourselves in our studio. He is completely hopelessly in love with Lady Chatterley. 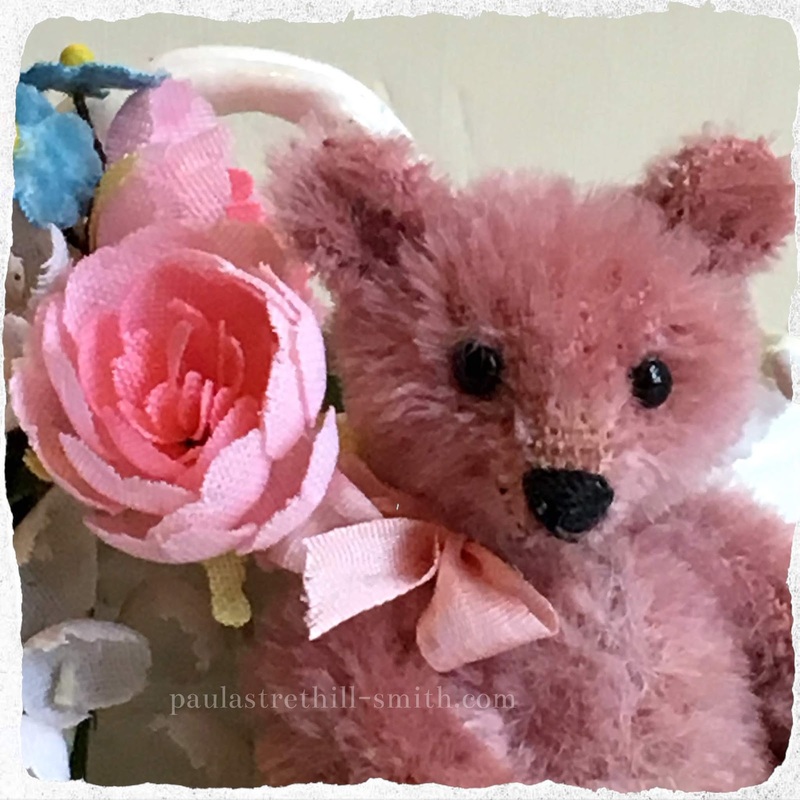 Posy is one of our very tiniest bears at 3"high made from hand dyed dusty pink mohair. 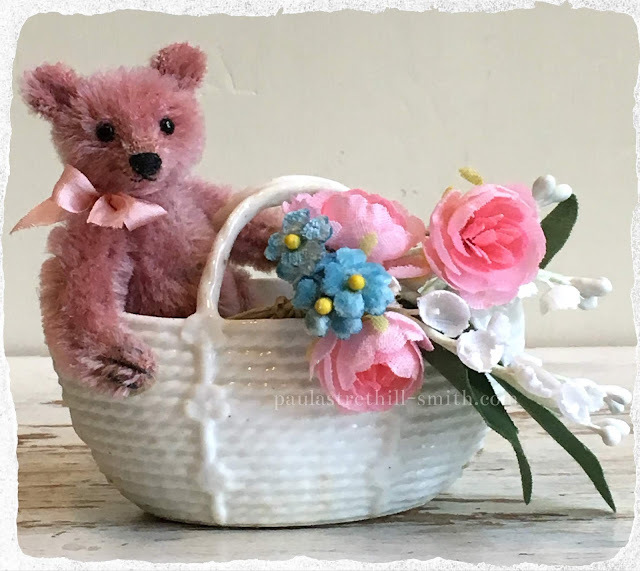 I have further aged and tinted her fur.Posy is sitting in a antique milk glass basket which is full of antique miniature flowers.She can come out of the basket and be displayed along side. Petite Cherie is one of our very tiny bears in shoes.The smallest size we do in shoes at 3"high. She is dressed in cotton embroidery anglaise skirt with pale grey velvet ribbon waistband. Petite Cherie wears pale grey velvet slipper which are hand stitched with leather soles. 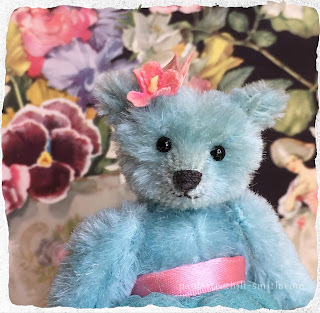 She carries a posy of antique blue velvet for-get-me-nots along with some pink velvet larger flowers. Around her neck she wears little silver tone vintage heart. 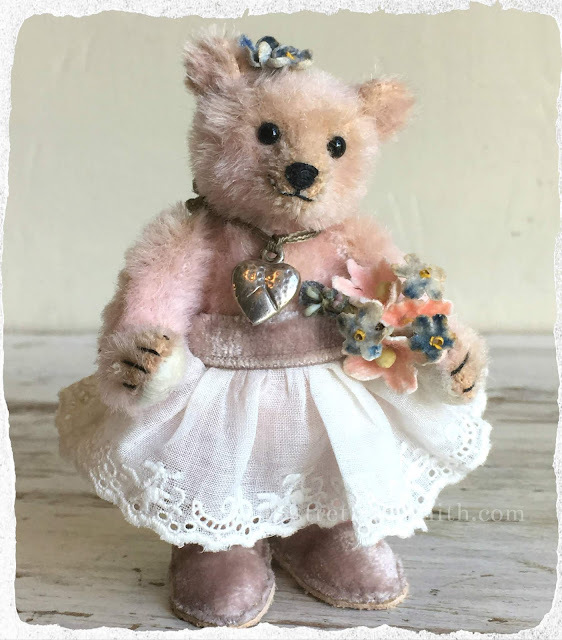 Petite Amorette is one of our tiniest bears in shoes at 3" high. 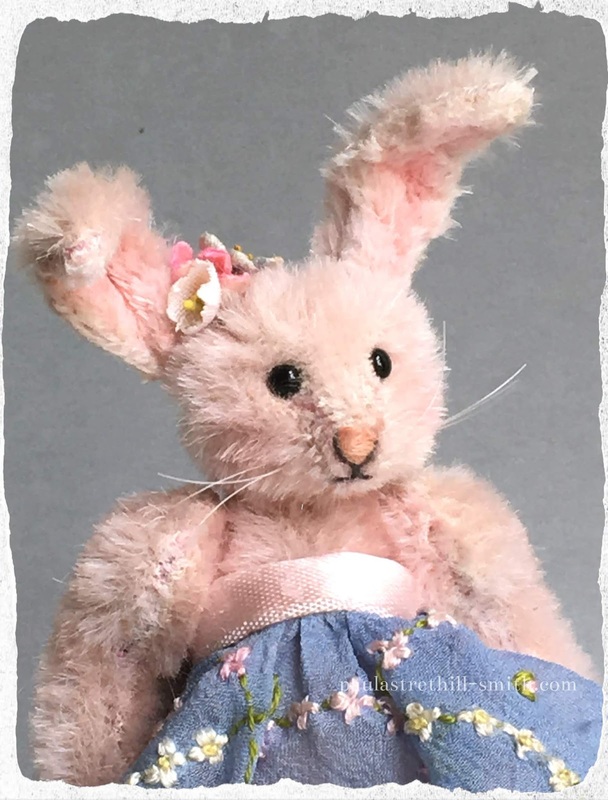 She is created from pinkish taupe hand dyed mohair. 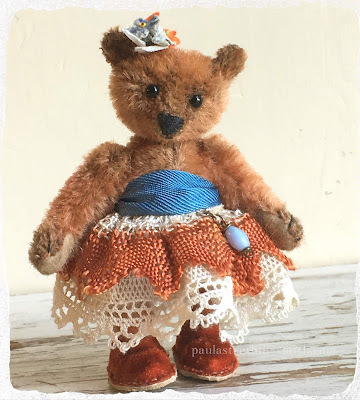 Petite Amorette wears a beige antique lace skirt with coffee colour ribbon waistband. and a vintage cocktail stick in shape of a arrow. Her slippers are made of soft grey silk velvet with leather soles. 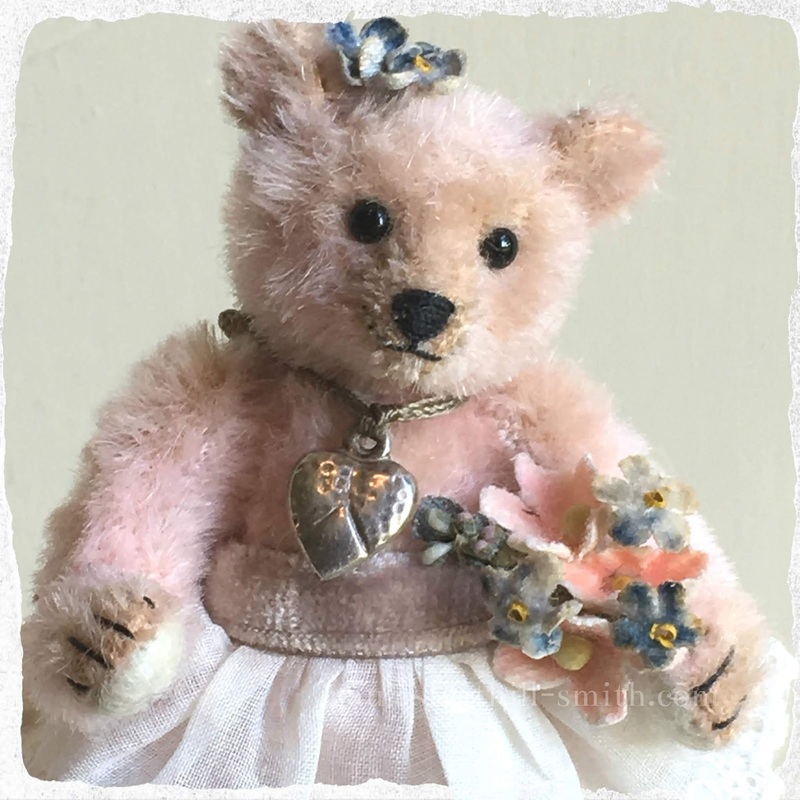 Thank you for visiting should you want to adopt any of our designs. Hello we will have small collection of teddy bears on Thursday evening. 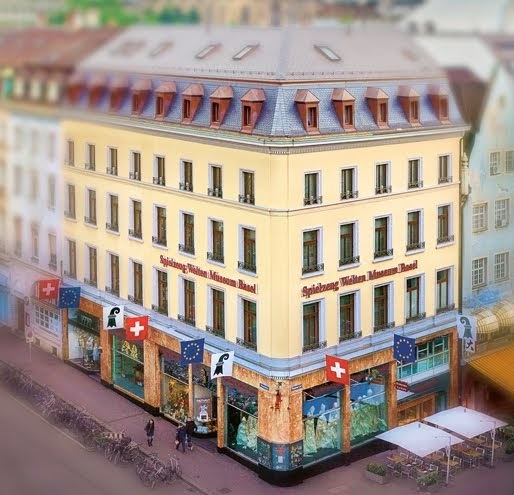 We hope you will be able to join us here on our blog. 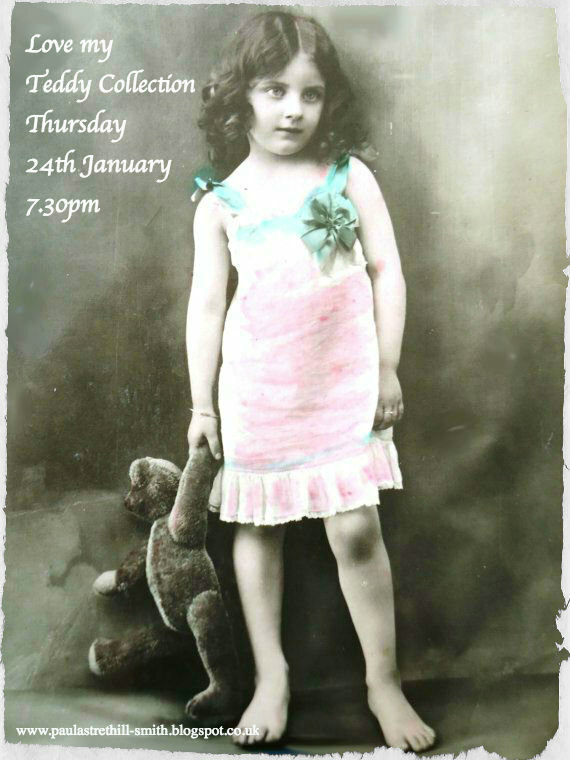 Thursday 24th January at 7.30pm u.k time. or just Bee for short. 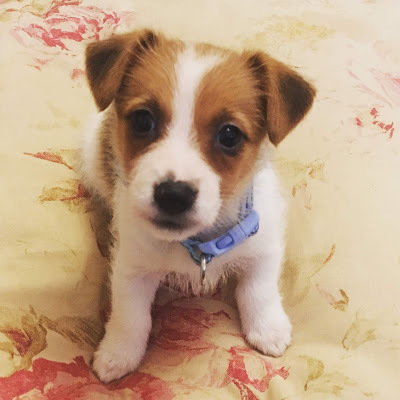 She is a rough coat short legged jack russell terrier nearly 8 weeks. Bee Bee is a busy as a little bee as you can imagine! 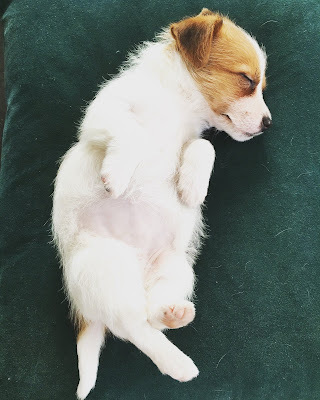 but we are doing our best to make bears when she snoozes. So just to thank you for your patience . 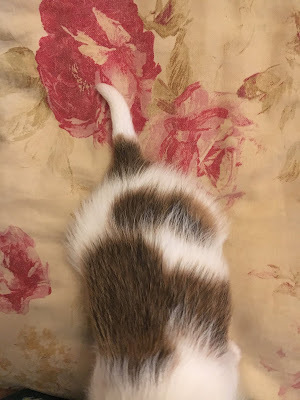 and on her very own instagram page. 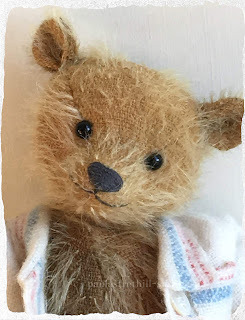 Join our mailing list for our latest teddy bear designs that are available for adoption. 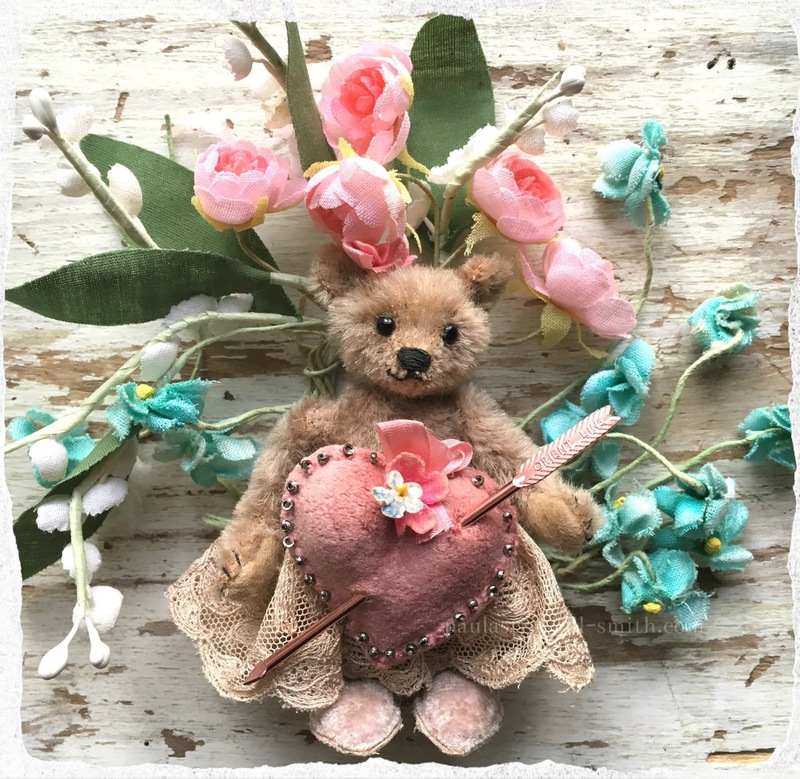 Hugglets Show and our latest designs. 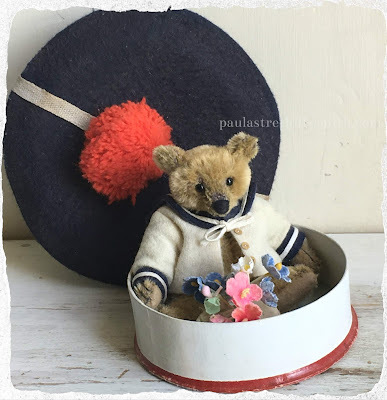 All Images are copyright of PaulaStrethill-Smith.. Simple theme. Powered by Blogger.